Art Babble is a terrific site that promises to get even better, and probably rapidly. Art Babble, the tagline for which is “Play Art Loud”, aggregates art related videos from a variety of sources, most notably museums like the Art Institute of Chicago, Museum of Arts & Design, Museum of Contemporary Art San Diego, Norman Rockwell Museum, Rubin Museum of Art, San Jose Museum of Art, The Solomon R. Guggenheim Museum, Van Gogh Museum, and Yerba Buena Center for the Arts; along with Public TV station KQED. For the most part these seem to be high end, professionally made videos that delve into a variety of art subjects. I’ve only had chance to watch one full video so far, and perhaps I got lucky, but I found it fascinating, illuminating and nicely erudite without being stuffy or overly technical. Research in progress: Van Gogh and contemporaries (images above), from the van Gogh Museum in Amsterdam, is a short in which a restorer from the museum examines a painting by Van Gogh and a painting by Monet side by side, utilizing a range of approaches, from naked eye to microscope to x-ray to ultraviolet, and explores similarities in their painting technique, the use of broken color and the choice to allow the ground to show through the brushstrokes to add to the color and texture of the painting. if the other videos are of this quality, I’ll be looking for a lot of spare moments to return to the site. You can view the list of videos by topic (“Channels”), by artist, by series or by the participating institution. 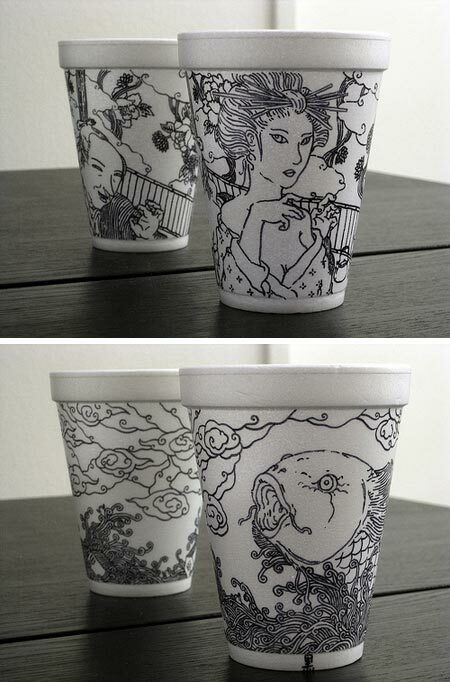 Cheeming Boey draws on styrofoam coffee cups with a sharpie pen. Those of us who have a tendency to doodle on whatever surface is handy may not think that surprising, but the degree of skill and work that he puts into his unusual medium is outstanding. His subjects range from cartoons to detailed stippled portraits to elaborate decorative drawings inspired by the style of Japanese prints. The drawings use the entire circumference of the cop, connecting with themselves in a continuous band. The flicker set of his cup drawings features them set against a mirror and also often includes multiple views of the same cup. There is a photo sequence of his process and a video as well. Boey’s cups sell in galleries for $120 to $220 and are sometimes placed in plastic cases. There is an article on him on the OC Register. You’ll often hear disparaging remarks about unorthodox art materials, particularly when they’re not “archival”. I dont’ know about the Sharpie ink, but Boey’s styrofoam “canvas”, as any eco-warrior will tell you, will last for a long long time. As a fun addition to my previous article on W. W. Denslow, here’s a piece on The Design Inspiration that has collected some contemporary artists’ interpretations of the major characters form the Wizard of Oz book and film: 25 Various Styles of The Wizard of Oz Illustrations. 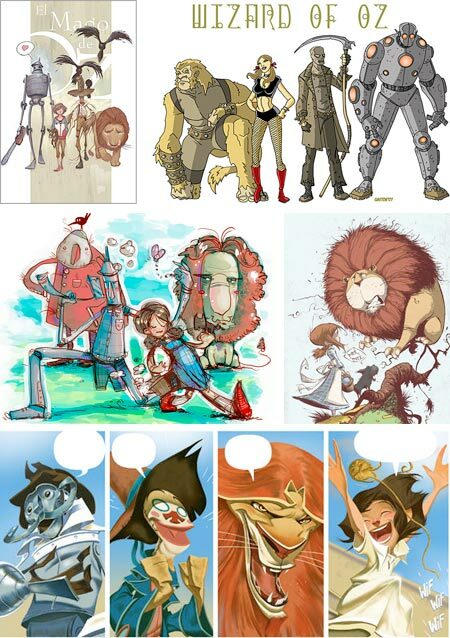 To this list you can add Nancy Dorser, Marvel Comics’ Skottie Young and Image Comics’ Enrique Fernández (also here). Many more people are familiar with the 1939 MGM movie The Wizard of Oz than are familiar with the source book, The Wonderful Wizard of Oz, written by Frank L. Baum and illustrated by W. W. Denslow. Though not as iconically linked with the title as, say John Tenniel was with Alice’s Adventures in Wonderland, William Wallace Denslow was the definitive illustrator for the first Oz book, and was co-owner of the copyright. The latter fact, and Denslow’s claim on profits from a very successful stage production of the story in 1902, for which he designed sets and costumes, caused a rift between Denslow and Baum; and Baum refused to work with him thereafter. Denslow had previously collaborated with Baum on three other children’s books. 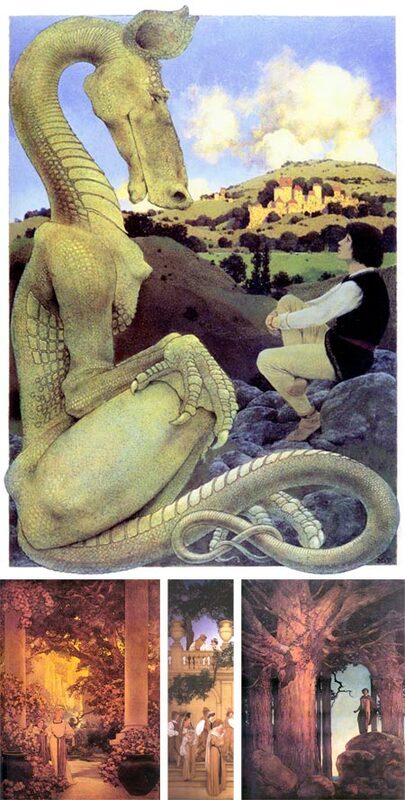 The following series of Oz books were illustrated by John R. Neil, an excellent illustrator with a very different style. Subsequent interpretations of the books were more in keeping with Neil than Denslow. 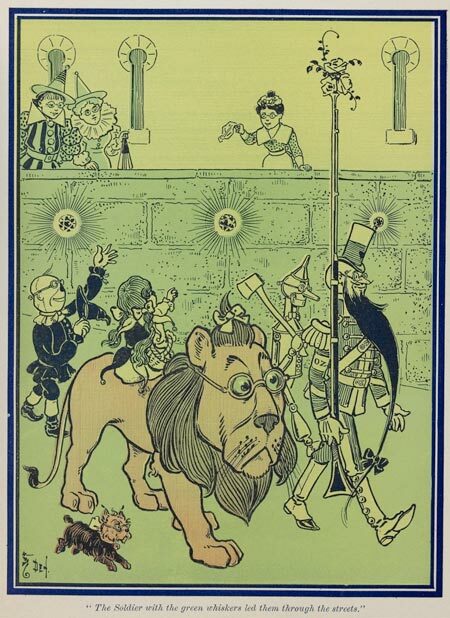 Denslow was an editorial cartoonist, with strong political views, leading many to look for political meanings in The Wonderful Wizard of Oz (see this Wikipedia article). He was born here in Philadelphia and studied at the National Academy of Design and Cooper Institute in New York. After his split with Baum, Denslow went on to illustrate other books with his now famous name, such as Denslow’s Mother Goose and Denslow’s Night Before Christmas, but it was royalties from the original OZ book and play that enabled him to buy an island off the coast of Bermuda and proclaim himself as its ruler, King Denslow I. The best online source for Denslow’s Oz illustrations is the always enchanting BibliOdyssey (see my previous post on BibliOdyssey, and here), which has an article on Baum with nice large reproductions of many of the multi-color plates and monochromatic illustrations from the book (click on the illustrations in the article). The original edition was very elaborate and stretched the book printing paradigms of the time, but the expensive printing costs apparently contributed to the book’s great success. You can see a reproduction of the entire original edition of the book on The Library of Congress. W. W. Denslow bio and The Wonderful Wizard of Oz on Wikipedia. Through some remarkable combination of circumstance and personal strength, the work of Judith Leyster was not lost to us; as must have been the case with countless potential women artists who were denied the opportunity to even pick up a brush by centuries of restrictive social convention. Leyster was active in Harrlem and Amsterdam in the first half of the 17th Century. She painted still life, portraits and genre scenes; particularly domestic scenes of women, a subject which she effectively pioneered. Many of her works feature dramatic lighting, and have a visible light source in the painting, an unusual practice at the time. 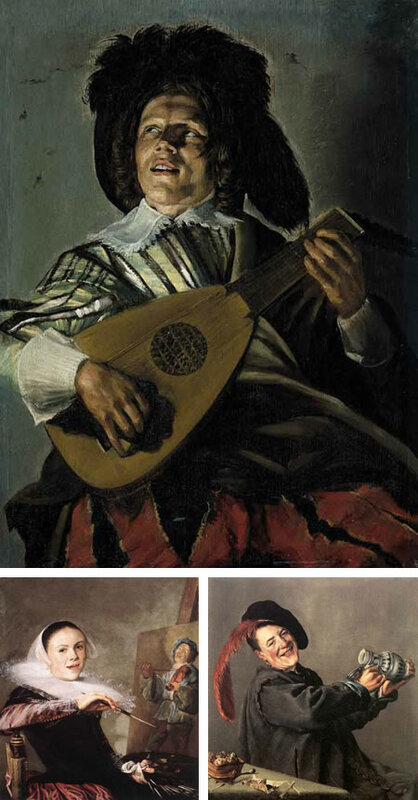 It’s presumed because of stylistic similarities that she was a student of Frans Hals, to whom much of her work was attributed for many years, including the image above, top, Serenade. To have had her work mistaken for that of Hals is a testament to her skill. She also showed the influence of the Utrecht painters who took their inspiration from Caravaggio . She married painter Jan Miense Molenaer, whose work she easily outshone, and shared a studio with him, along with models and props found in both of their paintings. 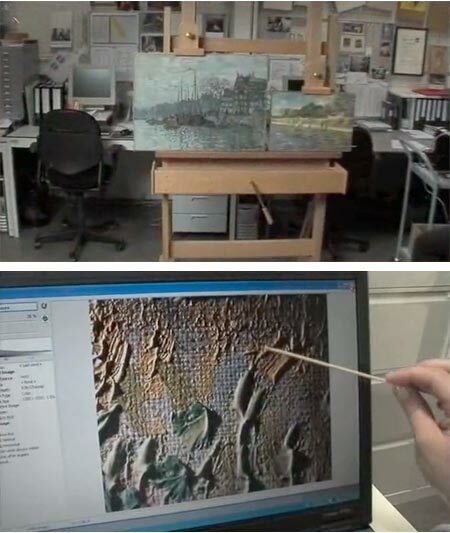 The image above, bottom left, is a self portrait. Like most artists’ self portraits at the time, it was essentially a demonstration of her skill and an advertisement for her abilities as a portraitist. This work is in the collection of the National Gallery in Washington, D.C., where it is currently the centerpiece of a show celebrating Leyster’s 400th birthday, Judith Leyster 1609-1660. The exhibition runs until November 29, 2009. There is a click-thgough slideshow (accompanied by period music) on the national Gallery site. Leyster’s active career was short, truncated by her duties as a mother, but at least we have her oeuvre as it stands. Today is the birthday of Maxfield Parrish, one of the great illustrators form the “Golden Age” of American illustratraton. For more, see my previous post on Maxfield Parrish, which includes a list of links to galleries of his work and other resources. I’ve included a few additional resources below that I’ve come across since then, in particular the large reproductions from The Arabian Nights on ASIFA-Hollywood Animation Archive. The list on my previous post is the primary one, however, with the most resources and images.